This Engagement Party Passport was based around my Realistic USA Passport Invitation with a few twists to the wording. The wording on the cover was changed to read "The Engagement of Marc and Nicole" as well as some changes to the wording inside. The realistic touches including the Passport Number which becomes the wedding date or, in this case, the date of the engagement party as well as the signatures of the couple on the "Signature of Bearer" line make this a fun way of informing guests of your upcoming celebration. Marc and Nikki had already decided they were getting married in beautiful Aruba so the addition of two stunning photos of their destination along with some passport stamps gave the passport invitation a tropical feel. "We received the invites they are PERFECT thank you"
I'm looking forward to working with Nikki and Marc again on the Save the Dates for their wedding as well as the invitations themselves. I'm sure she'll want to keep the whole travel theme going so watch this space for updates! Engagement Party Passport and More! This design was the perfect invitation for Nikki's engagement party but a similar design could also be used for other events or occasions. Passports make great Save the Dates, Order of Service, Menus or even Thank You Cards if you're planning a travel themed wedding or other event. If you're from America, getting married in the US or just like the look of the US Passport then contact me for details of how the invitation can be customised to suit you. Nikki and Marc chose the 4 sided passport design but I can also create them with a tear off RSVP card if required. If you also have additional information you'd like to include for your guests such as hotel recommendations or information about your wedding destination or resort I can also create Passports with 8 or 12 sides. 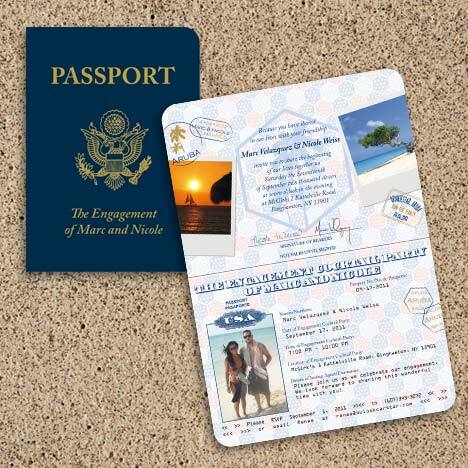 Click here to see more examples of Passport Invitations.